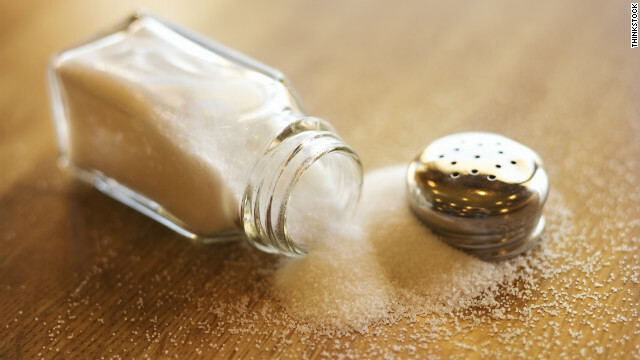 (CNN) We’ve covered the many health reasons to curb your salt intake. But let’s talk about how, especially when it’s hidden in many of the foods we love. When cutting back on sodium, it’s important to start slowly, as going cold turkey can shock your taste buds. “If you try to make chicken soup with no salt, you will notice the difference,” said Sonya Angelone, a registered dietitian who specializes in cardiovascular nutrition and is the media spokeswoman for the Academy of Nutrition and Dietetics. Instead, start with half of the amount of salt you would typically use. You can also look for low- or reduced-sodium versions of your favorite foods, or make your own versions, like homemade spaghetti sauce. For example, canned tomato sauce can have 1,000 milligrams of sodium per serving. “But canned tomatoes have about 300 milligrams, and tomato paste has very little sodium — so you can just add water or low-sodium chicken broth” to make a sauce, Angelone said. Using herbs and spices can help bring out flavor in foods without salt. Spice blends without salt can come in handy during cooking. You might use a Mexican blend with cumin, chili pepper and smoked paprika for chili, while blends containing rosemary, thyme and oregano might be well suited for Italian dishes, Angelone explained. When dining out, ask for steamed vegetables and fish, and skip the sauces. And when food shopping, compare the sodium values of similar foods. “Some rolls can have 400 milligrams; other ones can have 200,” Angelone said. Breads and rolls are top sources of sodium in the US diet, according to the American Heart Association, along with cold cuts and cured meats, pizza, soup, sandwiches and poultry. Be sure to look for hidden sources of sodium. Code words for sodium on food labels include fleur de sel, monosodium glutamate and disodium guanylate. And don’t be fooled by different forms of salt, which may appear healthier than they are. “Himalyan pink salt or kosher salt or sea salt all have the same amount of sodium,” Angelone said. And reduce the amount of processed food you eat. Sodium is a mineral that occurs naturally in foods and enters our diets through processed foods. White salt crystals are technically a combination of sodium and chloride. In fact, by weight, salt is about 40% sodium and 60% chloride. If you sprinkle a teaspoon of salt on your food regularly, cutting it out will eliminate a day’s worth of sodium. But that’s just skimming sodium’s surface, because only 11% of the sodium in our diets comes from the salt shaker, which we may grab during cooking or eating. About 15% of sodium in a typical American diet occurs naturally in foods. But the rest — more than 70% — comes from sodium in packaged, prepared and restaurant foods, including canned soups, frozen foods and lunch meats. Some of top 25 foods that add the most sodium to your diet include pizza, cold cuts, burritos, soup, cheese, milk, eggs, rice and cake. Manufacturers add sodium to help preserve food and enhance the flavor and texture. But they are contributing to our increasingly high sodium intake. If less sodium is added to foods during processing, it’s much easier for consumers to cut back. To help Americans achieve recommended sodium levels, the Food and Drug Administration recently proposed voluntary sodium reformulation targets for processed foods. In addition to limiting sodium, experts say that focusing on increasing potassium-rich foods is an important part of a salt detox. “Sodium stiffens your arteries … but potassium does the opposite,” Angelone said. To maximize your salt detox, Angelone recommends limiting overly processed foods that contain a lot of sodium and replacing them with more potassium-rich produce, as well as unsalted nuts, beans and legumes. “By eating less salty, processed foods and more simple fresh foods, you are going to automatically consume less sodium and more potassium,” she said. Finally, when you choose to consume salty snacks and foods, be sure to savor them. “If you are going to have salt, have it in something that really matters. … It makes food taste good, but make sure it really counts,” Angelone said.